One half mile south of the Grogan-Pennor-CA&C junction shown in the "Grogan & Pennor Yards" set of pictures is Gibbard Avenue which crossed the CA&C/N&W tracks that were so heavily used. This route went south from the above mentioned junction until it encountered the St. Clair Roundhouse where it turned west meeting with the Pan Handle tracks. Collectively the route then went further west past Ft Hayes where it turned southwest toward Columbus Union Station. This was first the CA&C route into Columbus Union Station. 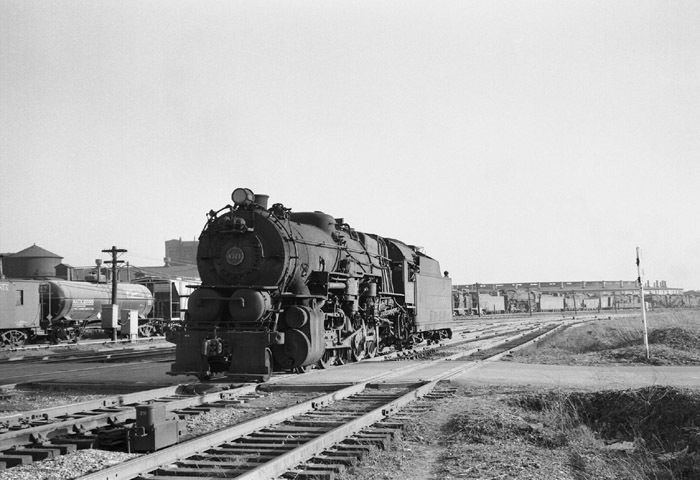 When the N&W came along it built a track parallel to the CA&C also into Columbus Union Station. The two railroads decided it made sense to operate the two tracks as one double track line. As traffic grew the track count grew until by the 1950's there were four or more tracks along this route. As you stood at Gibbard Avenue you could see the St. Clair round house and the 20th Street Shops to the east of the roundhouse. To the east of you were two small yards used to store steam for later use, store steam that wouldn't ever be used again and bad order cars. Steam stored serviceable usually had a cap on the smoke stack and other protective measures taken. Steam engines that were never to be used again often were missing parts and just plain looked forlorn. Standing at Gibbard Avenue you might see the N&W passenger train from Portsmouth, Coal trains received from the N&W heading to Logansport, Indiana via the PRR's Piqua line, or an N&W 4-8-0 heading for the N&W freight house. You might also see a string of C&O coal cars coming from Grandview Yard heading to Grogan yard for the trip to Sandusky, the CA&C freights going and coming from the Mt Vernon/Akron direction, and various merchandise trains going and coming from either the N&W or the Sandusky Branch. You would also see J1's and I1's running light between Grogan Yard and the St. Clair roundhouse. There was a lot of action at Gibbard Avenue. The slide show photos were all taken April 4, 1955 by Donald A. Kaiser.